Professor Dumenil’s talk focuses on popular culture images of women in World War I. That conventional notions of womanhood persisted suggests the continuing power of expectations about women’s traditional roles in the family. 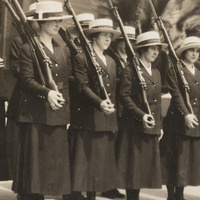 The attention given to “modern” women’s war service and heroic activism offered dramatic evidence of boundary-crossing women. But the media’s fascination with the novelty of women at war undoubtedly led it to exaggerate the degree to which American women challenged gender conventions and helps us to understand why many observers believed—inaccurately—that the war would prove transformative in reshaping women’s lives. WW1CC’s Symposium, Armistice & Aftermath, is a two-day series of presentations to be held at Michigan Technological University, Memorial Union Building, September 28-29. The symposium is open to the public and admission is FREE. For a complete list of WWI and The Copper Country events in the community please visit our Events Calendar.